Snowmass Midnight Magic is the Elite fleeced black male of all time. 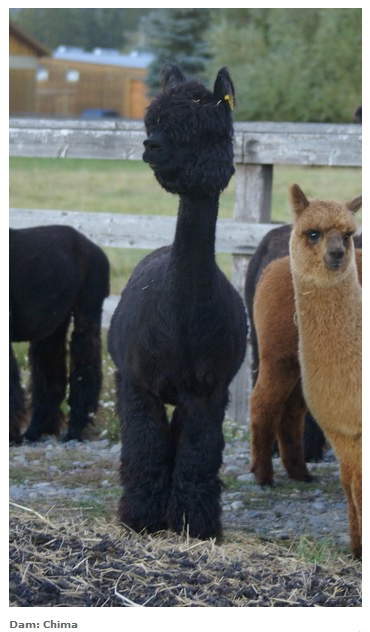 He is the perfect example of a Black Incan Alpaca. He is the male who?s fleece will create fine fashion garments that are as soft as the finest cashmere. 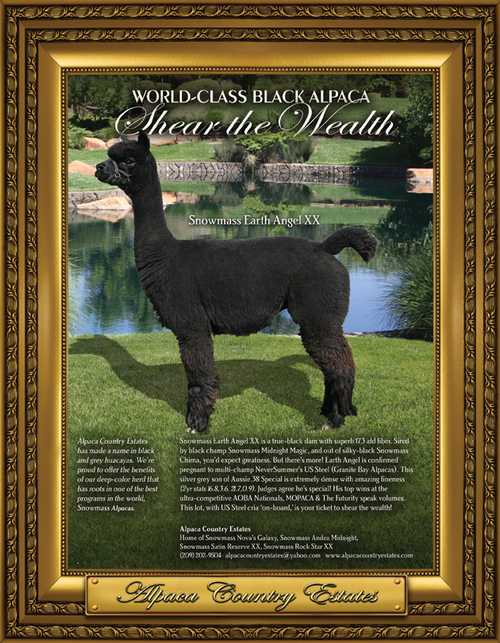 This come from his sire Snowmass Matadors Magic who is a true asset to vicuna fineness in a well advanced alpaca and his Dam 5Peruvian Ajoyani purchased for her own ultra fine black fleece. 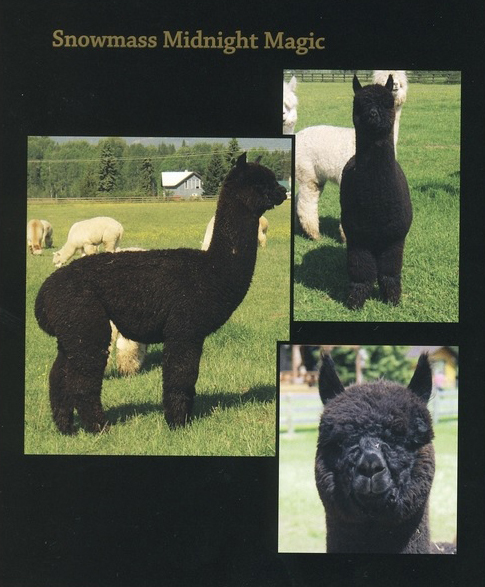 There is not an alpaca in Midnight Magic?s pedigree that is not on our Elite fleece list. 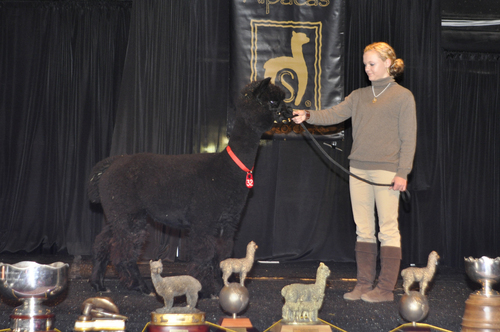 He has produce a strong line of ultra fine black Incan alpacas surpassing expectations. His first set of cria are all black and black as coal. 6 girls and 4 boys so far everyone like the perfect mold of himself. Many of the females he was bred to where out of Snowmass Nova so he had a solid foundation to start with the others are as exceptional no matter the lineage he has produced the most consistent set of black cria we have ever experienced. The combination of these to Black studs in any one alpaca is pure Black gold. If you are breeding for black this young Black stud is the key to fine fashion success in black and a most have. Snowmass Earth Angel is a true black out of Black (Champion Snowmass Midnight Magic - incredible phenotype with ultra-fine black fleece and Chima-cornerstone of Silky Blacks from Snowmass). Angel is a great mom (birthed easily with plenty of milk) and produced a spectacular black female out of Snowmass Matrix Midnight whom I've kept to continue these genetics in my black program. 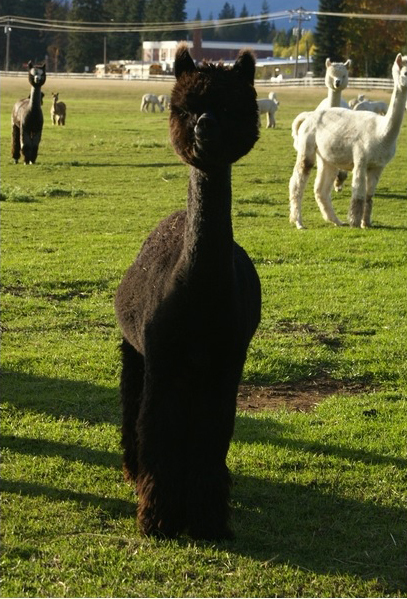 SNOWMASS MATRIX MIDNIGHT ENCHANTED, a fabulous TB female cria sired by Snowmass Matrix Midnight, was born on 10/2/2011. ESTATES EARTH WIND AND FIRE, a handsome MSG male sired by Multiple Champion NeverSummer's US Steel, was born on 1/5/2013. Steel is a handsome Silver Grey son of Aussie .38 Special. Steel is not only extremely dense but has amazing 2 year fiber stats (16.8, 3.6, 21.7, 0.9) backed by top placements (AOBA Nationals/Futurity Blue & MOPACA Champion (out of 42). On 4/9/2017, Earth Angel had a pretty MSG female sired by NS Magic Flight.